By Merel van der Vaart on Wednesday, April 23rd, 2014 in Blog, heritage, news, technology. How do you use Augmented Reality (AR) in a museum context? What are the usability differences of using iPads for AR compared to hiding an iPhone screen in a one-hand loupe device? A group of Virtual Museum Innovators got to compare results of the Allard Pierson Museum’s AR pilot study with the follow-up study in meSch. They tried out the meSch Loupe protoype and programmed their own instant AR experience which lead to discussions about the remaining challenges of AR in the museum. 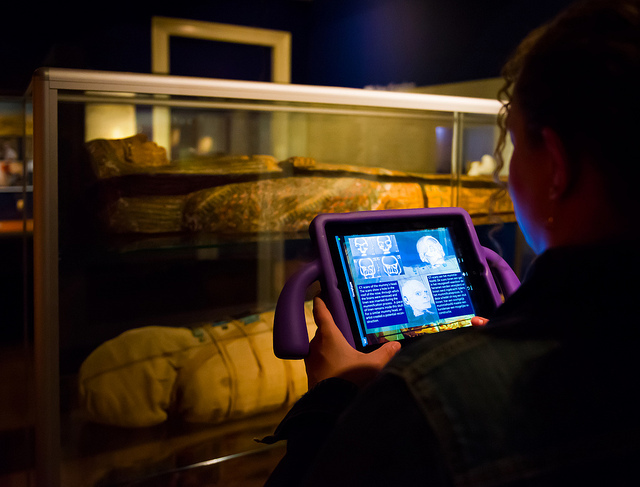 The study, that was part of the Eternal Egypt Experience exhibition, used a beta version of the InstantAR app generator, as developed by the Fraunhofer Institute. The fact that the software was still in beta provided museum visitors with some usability challenges. A visitor using the AR pilot as part of the Eternal Egypt Experience exhibition. Picture by Monique Kooijmans. It can be challenging to explain to visitors what they can expect from an AR experience. At the Allard Pierson Museum the iPads containing the AR software were freely available on gallery, close to where they could be used. Still, many visitors were reluctant to pick up an iPad. The installation did not have a clear interface and many people are not familiar with AR yet. During their visit, people are constantly making on-the-spot decision about what objects, text labels and installations to engage with. Not knowing what they will get in return for their effort can be a serious barrier to engagement for many people. The museum visit is a social experience and, to an extent, the museum gallery is a performative space. Most people do not like to feel exposed and do not want to be seen doing something ‘wrong’ or not knowing how to use an interactive. Insecurity might lead to disengagement. Also, when encountering a piece of technology they have used before outside of the museum space, visitors will try to use that technology like they have used it before. In the case of the pilot at the Allard Pierson Museum, visitors only had to point an iPad at an ‘active’ object in order to produce an overlay. Explaining that this was the only thing that was needed proved to be harder than expected. Often people tried to press icons that looked like buttons, replicating the act of taking a picture. 3. Where does it work? All ‘active’ objects were initially identifiable through a small iPad icon close to the object. However, visitors found it hard to locate these icons. Even when visitors were provided with a booklet listing all ‘active’ objects and large footprints on the floor indicated where to stand, some people struggled to identify where they could or couldn’t use the AR app. A second pilot was developed by Waag Society as part of the meSch project. This was a great opportunity for the Allard Pierson Museum to find a way to answer the three usability questions that were identified during the first pilot: What does it do? How does it work? Where does it work? Instead of iPads this second pilot made use of iPhones in a purpose built case in the shape of a loupe or magnifying glass so that visitors can hold the device with one hand. Any association with a specific device or technology is removed to avoid that visitors automatically try a fixed gesture vocabulary. The loupes were presented hanging from a display. On each loupe’s screen the words ‘pick me up’ lit up, while the display showed several icons explaining how the device worked. This should answer the visitor’s first two questions: What does it do? and How does it work? In order to answer the third question (Where does it work?) it was decided to create one connected experience that links objects, rather than letting the visitor chose which objects to augment and which to ignore. This provides with more clarity about which objects are ‘active’. It also generates a rounded story, rather than short individual experiences. Visitors saw the outline of the object they had to look for and had to tilt the loupe in order to move on and see new content. The video below shows how the loupe works. meSch prototype: the loupe from Waag Society on Vimeo. During the Meetup participants were given the chance to experiment with Aurasma. It is a commercial, but free app that allows you to create an entire AR experience using only an iPad or Android tablet. This means that you need a wifi connection throughout the creation process, which might be a challenge in a museum context. On the plus-side, the Aurasma website provides plenty of support and guidance on how to make best use of the app. As well as allowing you to upload your own overlays, a large number of different types of prepared overlays is also available. However, these overlays may not always be in line with the message or content you would like to share with your visitors. The Aurasma software is available for both Android and iOS (Apple) operating systems and seems like a good way for museums to familiarise themselves with the possibilities of AR, if not for creating visitor-friendly AR experiences. Most AR experiences that are based on image recognition use two types of images. First there is the marker image. This is an image of the object or location for which you want to create your AR experience. The system uses this image to recognize the location/object. The overlay is the second image you will have to create. This is the image that will appear on your screen on top of the camera input. The overlay is shown once an object or location is recognized by the system, because it matches a marker image. The first challenge is to make sure that the objects that you want to use as part of your AR experience provide a good marker image. If the image is unclear, or can change easily due to lighting, reflection or visitors standing on the other side of a glass case, the system will not be able to recognise the object. Also, if people can approach the object from many angles, of if both children and adults are expected to use the installation, you will have to make sure that the system will recognise the object from all angles. You can do this by linking many marker images, taken from multiple angles, all to the same overlay image. The second challenge relates to the creation of the overlay images. These need to be well designed images that fit in with the overall exhibition design and with text that is easy to read, for example. Most museums do not have an in-house designer or somebody with design skills at hand. The Allard Pierson Museum is hoping to further explore the potential content that can be used in AR experiences in order to better understand what kind of content works well and which content is less suitable. It might also explore possibilities for standardising content development, for example by using templates. This event was organized by the Virtual Museum Network Amsterdam and hosted by the Allard Pierson Museum on April 1, 2014. Meetups take place regularly and are open to everyone who becomes a member of the Meetup group. Feel free to join in next time!